Could a criminal justice overhaul be on the cards? Criminal justice issues affect all of us in one way or another – which is why we thought we’d give them some decent airspace in this issue. It’s been interesting, challenging and frustrating collating comments and concerns – which hints at the difficulty in changing the system. But throughout a very wide range of opinions, the need to change the dominating target culture screams loudest. Of course we need clear standards and boundaries – never more so than in this environment – but priorities in drug and alcohol treatment seem badly skewed away from fixing the underlying problems that trap people in the criminal justice system. Our interviewees give substantial food for thought. Paul Flynn MP thinks we’ve strayed a long way from ‘intelligent politics’ on this and we need to break courageously from media-led policies (page 9). Shadow justice minister David Burrowes sees the current system as totally unambitious and wants to refocus the approach on abstinence and recovery (page 10). And former chief inspector of prisons Lord Ramsbotham gives us the benefit of his experience to call for regional reorganisation of prisons, to give people the chance to work towards reintegration well before release. There was intense discussion between people working in all areas of criminal justice at the In somebody else’s shoes conference (page 6) and Jonathan Aitken gave insight from both sides of the system during the panel discussion. 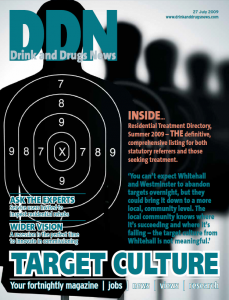 It’s a bumper issue before our August break, and we’ve included the much-requested residential treatment directory in this issue – which you can also find on our website. We’ll be back on 7 September, so in the meantime please keep us company on our website forum and ‘Your space’ pages and continue sending your letters and articles for the autumn. Hope you’re having a good summer!